Two pieces of vegetable samosa, onion bhaji, garlic tikka and seekh kebab. Pastry filled with spicy mashed potato and peas with Indian spices and herbs. Served with tamarind sauce. Fresh vegetables battered in chickpea flour and deep fried. Served with tamarind sauce. Sliced onion mixed with spices and chickpea flour and then deep fried. Served with tamarind sauce. Homemade cottage cheese battered in chickpea flour and then deep fried. Served with tamarind sauce. Homemade cottage cheese marinated in yoghurt spices and grilled in the tandoor with pieces of capsicum and onion. Served with mint sauce. Pieces of chicken wings marinated in yoghurt, ginger, garlic and Indian spices before grilling in the tandoor. oneless chicken pieces marinated in ginger and garlic paste with Indian spices and herbs before grilling in the charcoal tandoor. Prawns with tails marinated in yoghurt, ginger, garlic, and Indian spices and herbs before grilling in the tandoor. Spring chicken marinated in yoghurt, ginger, garlic, and Indian spices and herbs before roasting in the charcoal tandoor. Please confirm your taste for mild, medium, hot, kiwi hot or Indian hot curries when placing your order. All curries are gluten free and can be prepared dairy free. If you have food allergies please inform the service staff when placing your order. 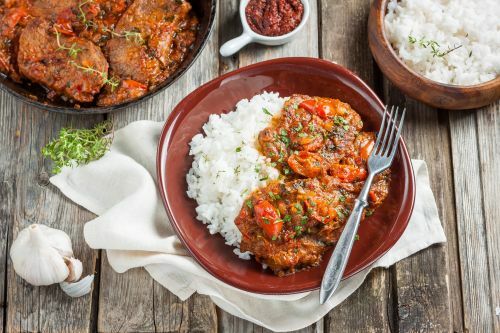 Tender boneless chicken morsels cooked in mild rich creamy tomato sauce. Chicken tikka cooked with green peas, beans, cauli in a cashew and almond based sauce. Tendered pieces of boneless chicken cooked to perfection with diced capsicum, tomato and onions. Tender chicken fillets grilled in the tandoor. Cooked with onion and capsicum pieces in chef's special tomato and onion sauce. Tender boneless chicken morsels cooked in very mild creamy gravy with a touch of mango, onion and capsicum. Chicken morsels prepared with green peppers, onions with a touch of garlic in a semi-dry sauce. Boneless pieces of your choice of meat cooked in tomato based coconut cream gravy with shredded coconut. A very popular North Indian curry. Tendered pieces of your favour meat cooked in chef's special spices and finished with green coriander. Choice of boneless pieces cooked with fresh vegetables using chef's special tomato sauce. Typical Goanese style meat morsels cooked in chef's special spicy sauce. Boneless pieces of your favourite meat prepared in rich creamy cashew nut gravy. Tendered succulent chunks of your chosen meat cooked with extra onion to produce an onion flavour. Tender pieces of your favourite meat cooked with fresh green spinach leaf and Indian herbs and spices. Choice of your favourite meat cooked in cashew nut gravy and touch of tomato gravy, with flavour of fenugreek. To suit everybody's taste, pieces of seekh kebab cooked in onion and tomato sauce. Boneless pieces cooked with onion, capsicum and a touch of fresh garlic and ginger before simmering with fresh selected spices. Marinated fish fillets cooked in exotic Indian spices and tomato gravy. Fish fillets cooked with pieces of capsicum and onion in chef's special onion and tomato sauce. Succulent fish pieces tempered with curry leaves, cooked in onion and tomato base gravy with a touch of coconut cream. Prawns cooked in exotic spices and tomato gravy. Prawns cooked in the tandoor and finished in chef's special tomato and onion sauce. Prawn cooked with fresh green spinach leaf with Indian spices and herbs. Chicken morsels prepared with green peppers, onions and a touch of garlic in a semi-dry sauce. A traditional Sounth Indian curry cooked with onion based sauce with touch of coconut cream and shredded coconut. Chicken morsels prepared with green peppers, onion and a touch of garlic in a semi-dry sauce. Lightly spicy yellow lentils cooked home-style with tempered onion, tomato, ginger and garlic. Lentils cooked in tomato gravy with butter and cream - highly recommended as medium spicy. Yellow potatoes cooked with fresh tomato and cumin seeds. Green peas and potato cooked in rich tomato and onion based gravy. Cauliflower and potatoes cooked with dry ground spices. Chickpeas cooked with spices in thick sauce. Fresh seasonal vegetables cooked in chef's special tomato and onion based sauce, finished with fresh ginger and green cucumber. Green peas and mushroom cooked in rich tomato and onion based gravy, finished with fresh ginger and green coriander. Fresh vegetables prepared in a rich creamy cashew nut gravy with a touch of onion and tomato sauce. Fresh homemade cottage cheese cooked to perfection and finished in chef's special mild tomato sauce. Fresh homemade cottage cheese cooked in the tandoor and finished in chef's special tomato and onion sauce. Fresh homemade cottage cheese cooked with fresh green spinach leaves and Indian spices and herbs. Then finished with a touch of cream. Delicacy of India. A deep fried ball of mashed cottage cheese prepared in a thick mild cashew nut gravy. Fresh seasonal vegetables cooked with rice and spices. Pieces of your favorite meat cooked with rice and exotic fresh spices - full of flavour and aroma. Prawns cooked with rice and exotic fresh spices - full of flavour and aroma.